The trigonometric function of the complement of an angle. The tangent, for example, is the cofunction of the cotangent. 1. The act of gathering things together. 2. A publication containing a variety of works. 3. Several things that are grouped together or considered as a whole. 1. A state of confusion and noisy disturbances: Shirley was upset by all of the commotion that was going on across the street from her house where they were having a late party. 2. 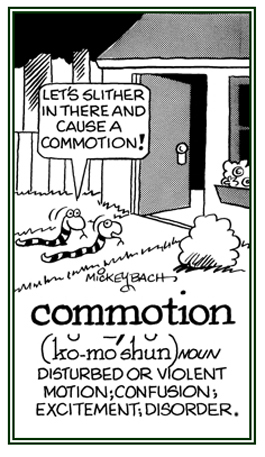 Etymology: from Latin com-, "together" + movere, "to move". © ALL rights are reserved. 1. The process of trying to win or to do something better than others or the activities of companies that are trying to be more successful than other businesses: "Several companies are in competition for the contract." A market condition in which prices and supplies are not established by any particular group; that is, they are influenced by many market participants and forces, and not determined by a regulatory body. 2. An activity in which people try to win something or to do better than others can or the activities of people who are trying to get something that other people also want. 3. The opposition in a competitive situation, or the level of opposition including the efforts of people who are trying to win prizes by being better than the other people. 4. The person, company, or thing that someone is competing with. 5. The struggle between organisms (insects, animals, etc.) of the same or different species for limited resources; such as, for food or light. The struggle between individuals of the same or of different species for food, space, light, etc., when these are inadequate to supply the needs of all of them. 6. A type of activity existing among two or more elements of a system when each is striving to maximize its use of a finite and/or a non-renewable resource. Agricultural land is an example of a finite, renewable resource while mineral deposits are examples of finite, non-renewable resources. Competition for finite resources tends to accelerate rates of depletion or leads to overuse, but the overuse of finite, renewable resources can be corrected by altering the rewards and costs of marginal changes that are in use. 1. The way in which something or constituents thereof are combined or arranged: The family composition in the portrait was very pleasing. The composition of the apartment building is diverse, including residents from many walks of life. In the art lecture, the instructor, Mr. Straight, described parts of a visual image of an artist's composition of a group portrait. 2. The spatial property resulting from the arrangement of segments in relation to each other and to the whole: The art students were studying the three dimensional compositions in many of the famous artist’s abstract works that were on display at the local gallery. 3. The act or process of combining things or ingredients to form a unified whole: What is the composition of this delicious cake recipe? 4. The act or process of creating something; such as, a piece of music or writing: The teacher graded Mary's composition, "Flowers in My Garden", and gave her a good grade for her efforts. 5. The formation of larger words made up of smaller separate words: The term "wordsmith" is a composition made from two separate words, "word" and "smith". 6. The setting of type in preparation for printing: During his newspaper career, the editor, Mr. Jackson, became an expert in the composition of eye catching headlines. 1. A strong feeling of uneasiness or anxiety of the conscience caused by regret or guilt for doing something wrong or causing emotional pain and suffering: Jack had a feeling of compunction when he couldn't celebrate his mother's 90th birthday with her because he had to work late in order to complete a project that he was working on. 2. Any uneasiness or hesitation about an action being proper: Wouldn't anyone have compunctions about meeting the Queen and not knowing what to wear or what to say on such an occasion? 3. A sting of conscience or a pang of doubt aroused by doing something wrong: Rodney was filled with compunction after he lied to his parents when he told them that he had done his homework for school; however, he actually spent his time reading comic magazines instead. 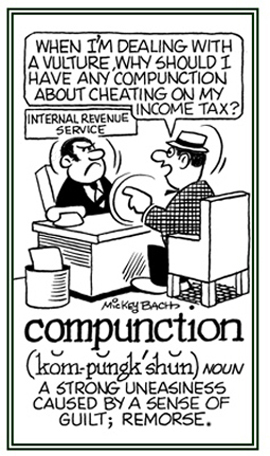 Compunction is a strong, sudden, and unpleasant regret or emotion of guilt. 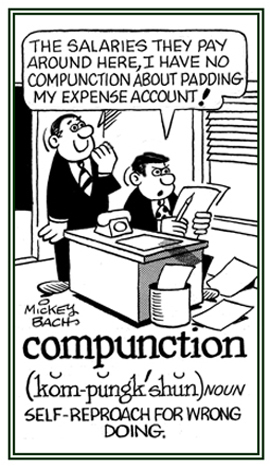 Etymology: from Latin concep-, concipere, "to take in". 1. The process in which separate parts or particles come together into a solid mass; such as, a hard lump produced by the concretion of mineral salts which are found in hollow organs or ducts of the body: "The doctor told him that there were concretions in his kidneys; which are commonly called, "kidney stones". 2. A hard solid mass formed by parts uniting into a whole; for example, an increase in the density of something. 3. A mass of inorganic material in a body organ or tissue, usually caused by a disease in the formation of stonelike objects within a body organ; for example, the kidneys. 1. The conducting of liquid through a channel or pipe. Now chiefly applied to natural processes, e.g. the movement of sap in plants. 2. The transfer of heat between two parts of a stationary system, caused by a temperature difference between the parts. 3. The transmission or conveying of something through a medium or passage, especially the transmission of electric charge or heat through a conducting medium without perceptible motion of the medium itself. 4. The carrying of sound waves, electrons, heat, or nerve impulses by a nerve or other tissue in the body. 1. The part of speech that serves to connect words, phrases, clauses, or sentences; for example, and, because, but, etc. 2. A combination of two or more things. 3. 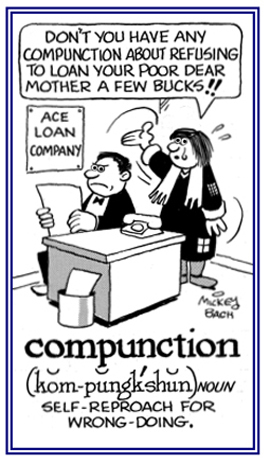 A situation in which events or conditions combine, usually influencing other events. 4. In astronomy, the apparent meeting or passing of two or more celestial bodies in the same degree of the zodiac or the appearance of two planets very close to each other or in the same place on the celestial sphere. 5. The position of a planet or the moon when aligned with the sun, as seen from earth. Showing page 5 out of 21 pages of 308 main-word entries or main-word-entry groups.